This isn’t a new update, just forgot to post this update until now. 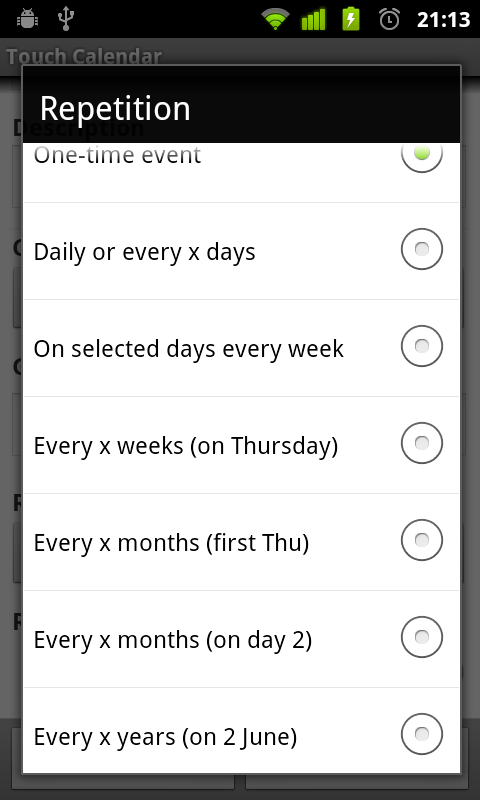 “Select calendars” option screen added to widget settings – calendars can now be selected separately for each widget Added several more reminder time options Fix for issue where calendar would start on a random date, goto date/today would not go to the correct date, and widget taps would go to the wrong date sometimes. Also fixed related ‘double-events’ issue. If you still see this happening, please let me know! Lots of updates at the moment I know! This one’s to provide a workaround for issues some people have been having on Galaxy S and Galaxy Tab devices, where events added on the phone or tablet don’t sync to Google Calendar. The workaround is a new setting: “Edit in built-in calendar”. Check this and you’ll be able to use the Samsung calendar to add/edit/view events, which means they’ll sync to Google Calendar correctly. Note: I don’t recommend using this setting for any other devices.